The good folks at Sangean US sent me one of their newest goodies a few weeks ago, the little WR-7 and I haven’t wanted to put it down since I opened the box. When I saw the brochure, I didn’t appreciate how tiny this unit is but its high-tech speaker will amaze you with how much powerful sound it can pour out. Available in Walnut or Dark Cherry the WR-7 has a fullness of sound that belies its small size and I find myself marveling at how well I can hear the bass lines of my favorite songs. 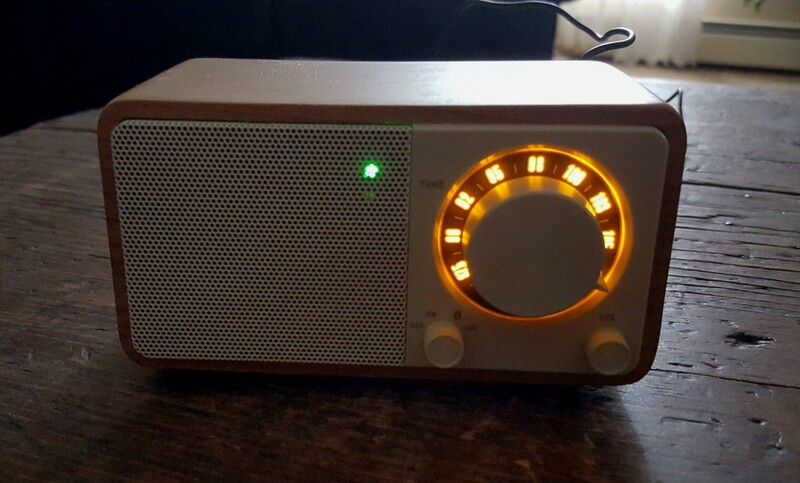 Of course, no tiny radio can pump out the kind of real bass a larger speaker can – the laws of physics haven’t changed, but the quantity and overall balance of audio Sangean has achieved with this clever speaker design will absolutely surprise and delight you. 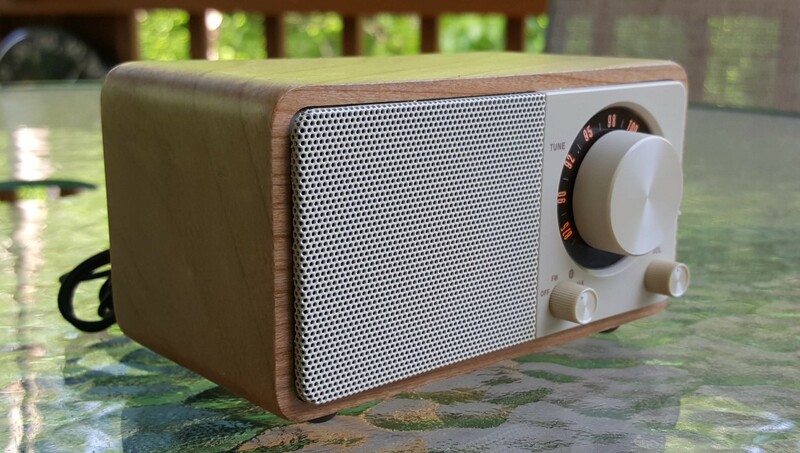 Description: It’s as simple a radio as you will find. The left control knob turns the radio on and selects FM, Bluetooth or Aux input, while the right-hand knob is the volume. The tuning knob is easy to use and the dial scale is nicely lit at all times. There are two LED indicators – a red Charging light and a green Tune light which turns blue in Bluetooth mode…very cool. In Use: I encountered no surprises using the WR-7…everything was as intuitive as could be. The Off/On/Mode Select and Volume knobs are a bit tiny but that wasn’t a big issue for me…the Tuning Knob turns easily and is fairly well calibrated. This is a sensitive FM tuner with superb reception. The first thing I did was to tune around the FM dial using the supplied antenna wire and I was happy to see that this is a very sensitive and selective FM radio, able to separate all my problem signals easily…it will rank as 4 Stars in the FM Mega Shootout article which is excellent for this class of radio. Although just a very small hair less sensitive than the best 5 Star FM tuners, the difference was very slight and required many station comparisons to ascertain…it is that close. It is however very selective and apparently has an excellent capture ratio as it was able to not only resolve the many adjacent signals I receive here but it was also able to select multiple stations on some frequencies as well as my reference radios by re-orienting the wire antenna. I also found that it wasn’t necessary to use that FM antenna wire for most of the typical suburban grade signals at my location but it certainly helped for weaker out of town signals. 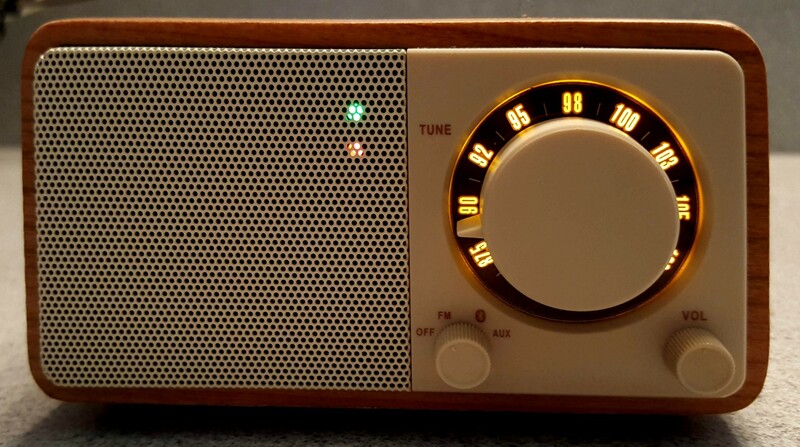 The WR-7 is an excellent FM radio. 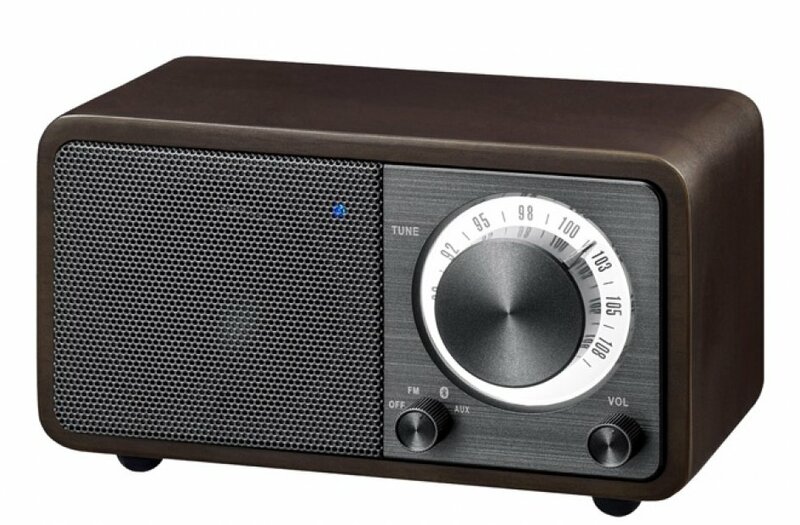 Actually I think Sangean should have called it a Mini FM radio with Bluetooth…the FM is just too good to be billed last. Bluetooth was also trouble-free. I paired it with my Android phone and listened to streaming audio and podcasts in much better sound than my phone produces. It is also small enough to carry around room to room with no problems. Sound Quality is, as I said at the beginning, simply outstanding given the radio’s tiny size. You’ll notice that most of the back of the radio is used as a bass port…this technology has quickly evolved in the past few years and is giving us new audio devices which sound much bigger than they are. 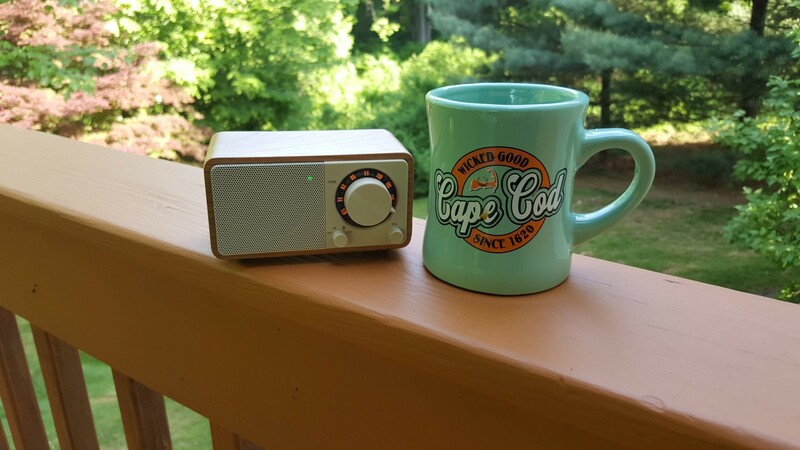 Even outside on the deck the WR-7 fills the space with pleasing audio and a sense of fullness you wouldn’t expect given its size. Conclusion: The Sangean WR-7 sounds better than it has any right to and has an excellent FM tuner in addition to Bluetooth capability. The FM dial is well marked and continuously illuminated making it very easy to tune. It can also be used with an Aux audio input…I plugged in a battery-operated CD player and the results were great. The 2600 mAh Lithium-Ion Battery gives up to 35 hours of battery life between charges. I haven’t actually done a battery life test on it but it survived a long weekend playing at medium volume outdoors so run time shouldn’t be an issue. 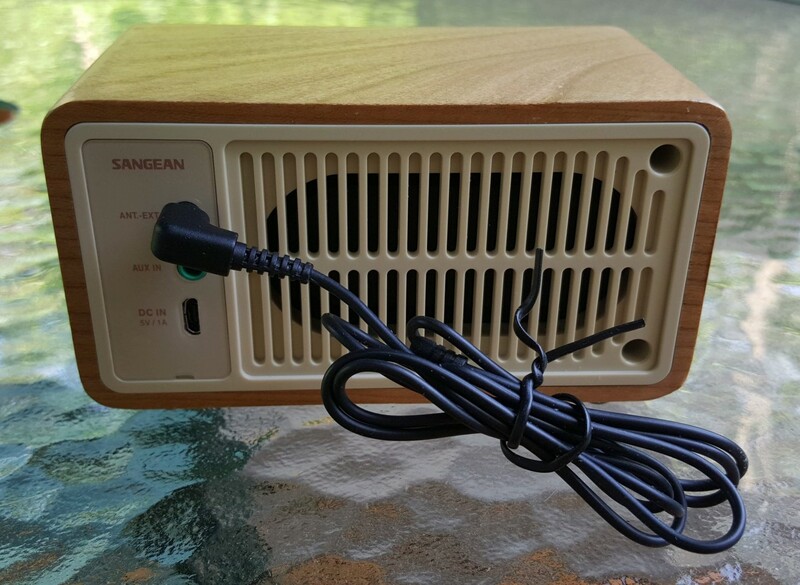 It can also be operated while plugged into a USB source with no degradation of performance…the Sangean WR-7 – the little radio that could.